Boosted by four strap-on engines, the three-stage Long March 3B launcher lifted off at 1551 GMT (11:51 a.m. EDT) Sunday from the Xichang launch base, according to the China Academy of Launch Vehicle Technology, or CALT. The 184-foot-tall (55-meter) Long March 3B turned toward the east from its launch pad, surrounded by mountains in southwestern China’s Sichuan province, and headed downrange, dropping its four hydrazine-fueled boosters and core stage to fall back to Earth less than two-and-a-half minutes after liftoff. The launch occurred at 11:51 p.m. Beijing time. The Long March 3B’s second stage fired next, followed by ignition of the cryogenic third stage engine, which burned liquid hydrogen and liquid oxygen to deliver the first in a new generation of Tianlian tracking and data relay satellites into orbit. 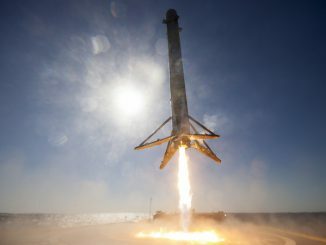 Chinese officials declared the launch a success. 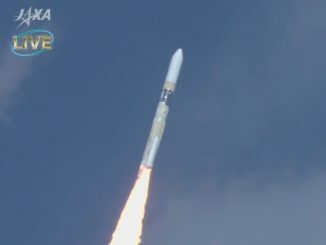 U.S. military tracking data indicated the Long March 3B rocket deployed the spacecraft in an elliptical geostationary transfer orbit ranging between 114 miles (184 kilometers) and 22,259 miles (35,823 kilometers), with an inclination angled 27.1 degrees to the equator. The satellite launched Sunday is the first spacecraft in China’s Tianlian 2 series, a new family of bigger, more capable communications satellites to link ground controllers with Chinese Shenzhou crew capsules and China’s planned space station. China launched four Tianlian 1 satellites from 2008 through 2016 and positioned the spacecraft at nodes around the world in geostationary orbit more than 22,000 miles (nearly 36,000 kilometers) over the equator, where they move at the same rate as Earth’s rotation, enabling global connectivity for missions orbiting at lower altitudes. Before the Tianlian satellites, Chinese controllers relied on a patchwork of ground stations to link with space missions. Those only provided partial coverage, leaving mission controllers out of contact with satellites and Shenzhou crews most of the time. The Tianlian satellites are similar in function to NASA’s Tracking and Data Relay Satellites, which began launching in the 1980s to support space shuttle missions. The first Tianlian 2-series satellite will use its on-board engine to climb into a circular geostationary orbit. Its planned operating slot in geostationary orbit has not been disclosed by Chinese officials. 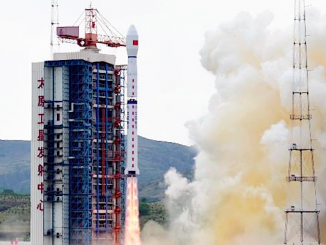 Compared to the earlier Tianlian 1 satellites, the Tianlian 2 satellites will provide faster data transmission rates between ground stations and spacecraft in low Earth orbit, and will be able to connect to more spacecraft at the same time, according to Chinese state media reports. The Tianlian 2-series satellites are built by the China Academy of Space Technology, the state-owned manufacturer of most of the country’s large satellites. The new data relay craft are based on CAST’s DFH-4 satellite platform. China could launch the core module of its space station into low Earth orbit as soon as next year. Additional launches will follow with research modules, logistics carriers and Shenzhou spaceships carrying crews to the orbiting complex. Sunday’s mission was China’s fifth space launch attempt of the year, four of which have been successful.